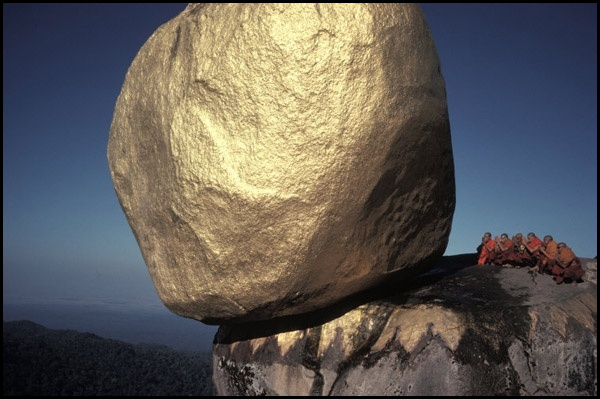 The Rangoon Gold Rock-Kyaikto- is a pillar of Burmese Buddhist worship, as it clings to a mountain top perch. The rock has survived treacherous monsoons and earthquakes and was gold coated with gold leaf to symbolize Buddhist permanence. A glorious, gravity defying monument that instills the feeling that anything may be possible. The city of Yangon lies in southern Myanmar on the Yangon River. The city is full of life and nature; however with the vast covering of forest, it's amazing to think that so many people call this jungle like setting their home. 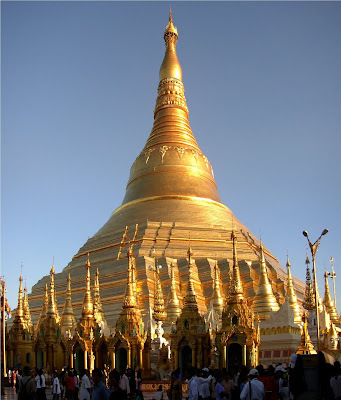 Besides the grandeur of the gravity defying golden rock, Yangon's sacred site at the Shwedagon Pagoda in Myanmar is a mirage of diamond encrusted buildings and gold, sitting atop the Yangon hills. The temple's exact age has not be concretely defined, as the stretch of time in which this structure was built was somewhere between the 6th and 10th centuries. As the story goes, two merchant brothers, Taphussa and Bhallika, from the land of Ramanya, meet Lord Gautama Buddha and receive eight of the Buddha's hairs to be enshrined in Burma. The two brothers made their way to Burma and with the help of the local king, King Okkalapa, found Singuttara Hill, where relics of other Buddhas preceding Gautama Buddha had been enshrined. I've never heard of this. Seems like a great travel destination. Always well written and interesting Lauren.